After two strong experiences at Ikko and Nana-san I was inspired to hit up more of Orange County's top spots. 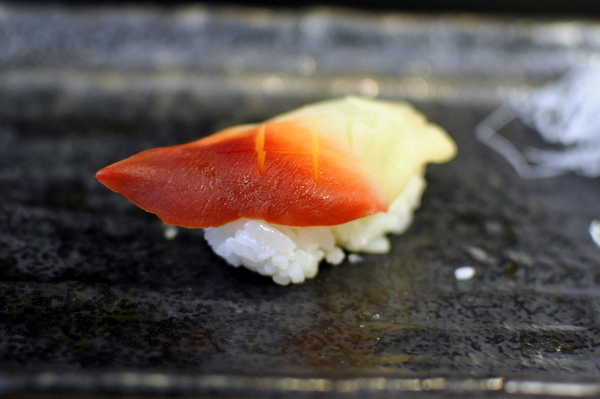 I'd actually been to Sushi Shibucho a few years back but left disappointed with my experience. 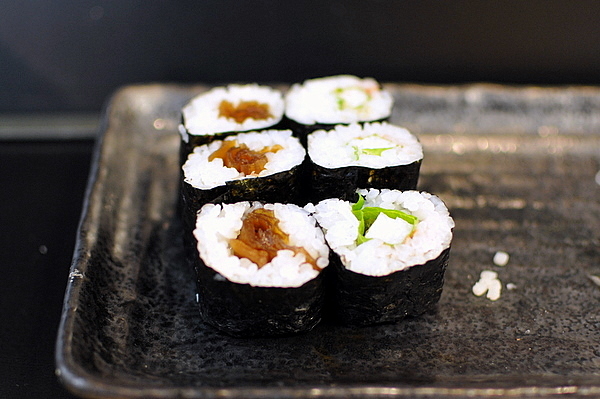 At the time, I was still learning about sushi and felt uncomfortable sitting at the bar. 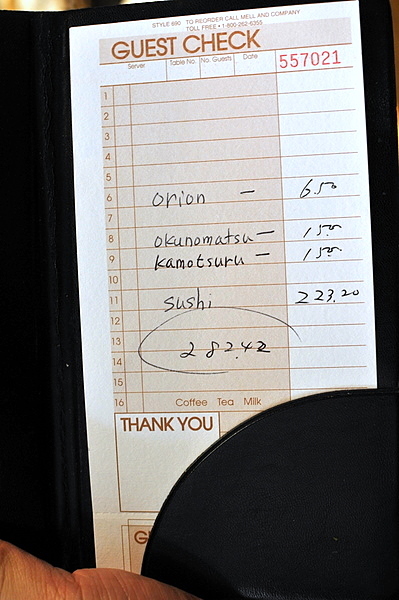 I opted for having the omakase and was disappointed to see a large platter of tired looking sushi brought to the table. Though I was disappointed by the experience, enough time has passed for me to give the restaurant another chance. 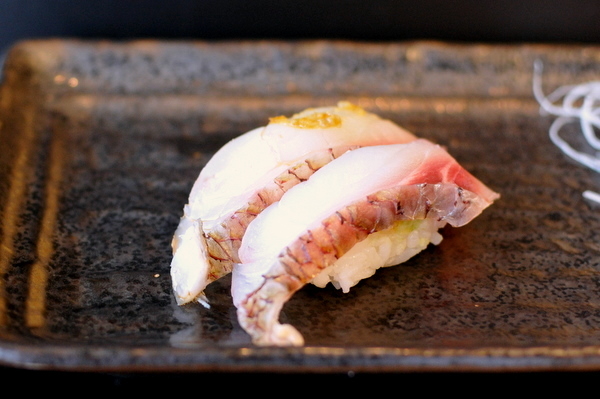 Sushi Shibucho can be considered the spiritual successor to Shibucho in Los Angeles. 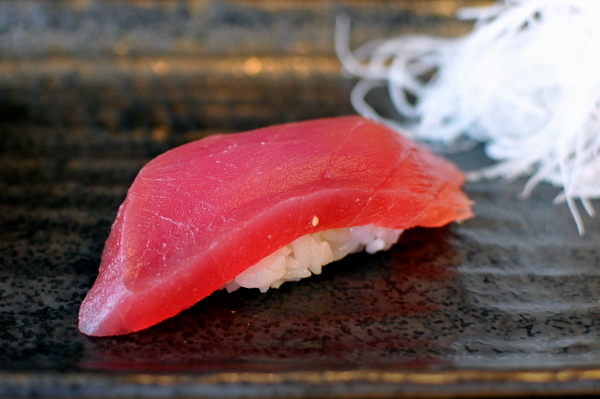 Opened by Sakae Shibutani in 1976, the original Shibucho was arguably the first true sushi restaurant in Los Angeles. Eventually Shibutani sold the restaurant to Shige Kudo a former employee who still runs the restaurant today. The OC outpost of Sushi Shibucho is run by Sakae's and his son, Naga, who learned the art of sushi from his father. 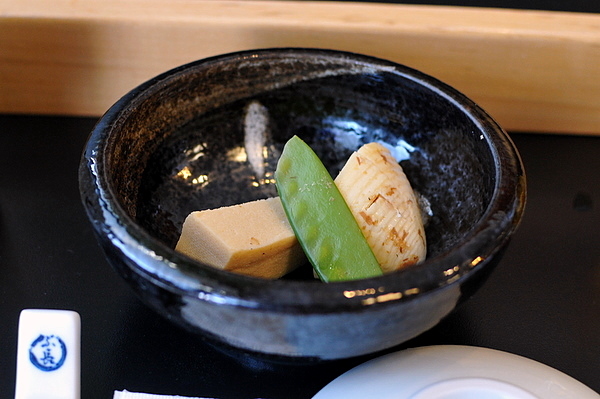 Our meal started with a small bowl of marinated bamboo and tofu. The tofu was a welcome surprise, saturated with a savory sweet broth giving the duet a pleasing heft. We were presented with two pieces of snapper, one came seasoned while we were told to take the other with soy. The fish lived up to its name presenting a firm pliant texture set off perfectly by the warm rice. As for flavor the traditional preparation was enjoyable, but I preferred the expansive flavors of the one seasoned with yuzu kocho and rock salt. 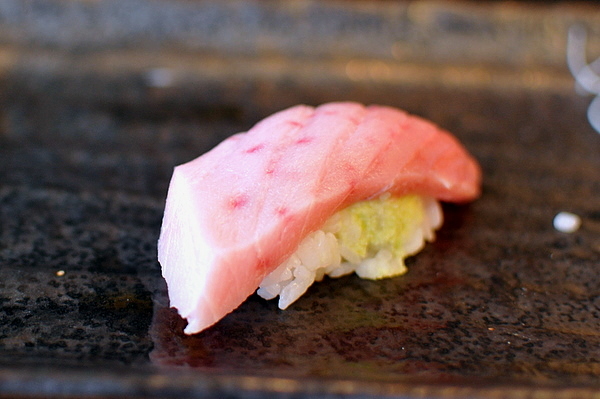 Cool and fleshy, the clean simplicity of the fish contrasted beautifully with the potent sting of the wasabi. 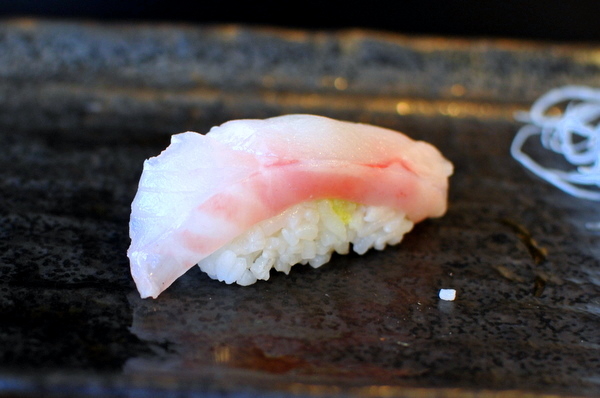 A textbook toro, disconcerting red spots aside, the fish was tender and marbled to the point of having an almost jellied consistency coupled with an appropriately weighty oily flavor profile. 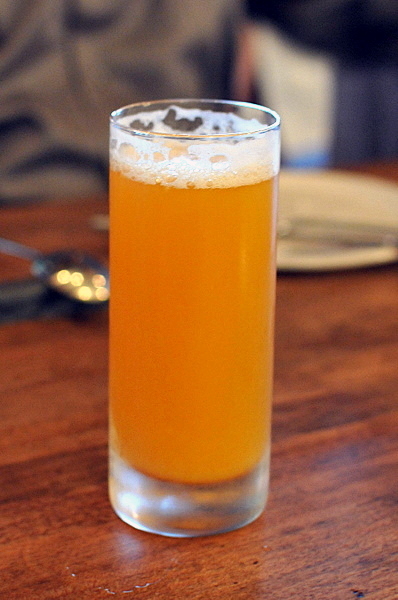 A fairly subdued example of orange clam, the shellfish's sweetness is balanced by an earthy brine. 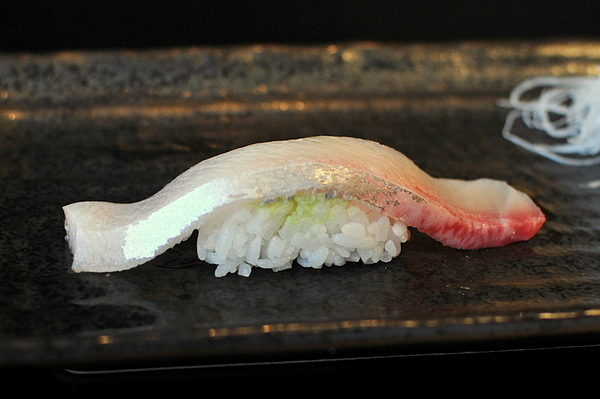 Aji is always one of the more expressive sushi fishes, the potent oily richness is tempered by a generous topping of fresh scallion and grated ginger. 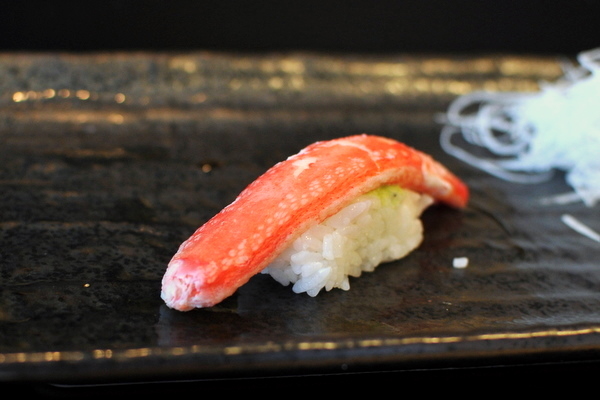 Next up was an extremely unconventional nigiri, the crab is surprisingly delicate with the wasabi running rampant until the finish when the crab's sweetness comes to the fore. 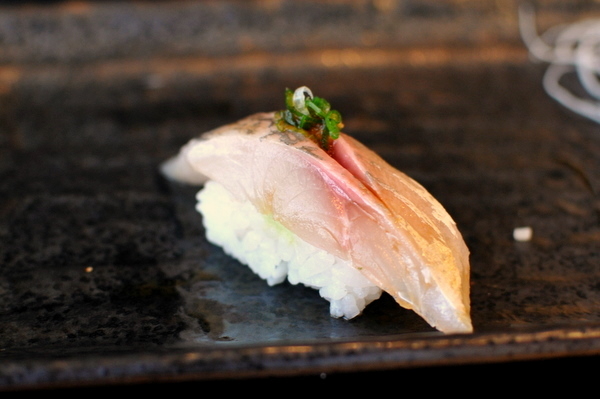 Another rare fish, Kinki or rockfish is reminiscent of a snapper, with the same mild flavor but a bit more vigorous snap. 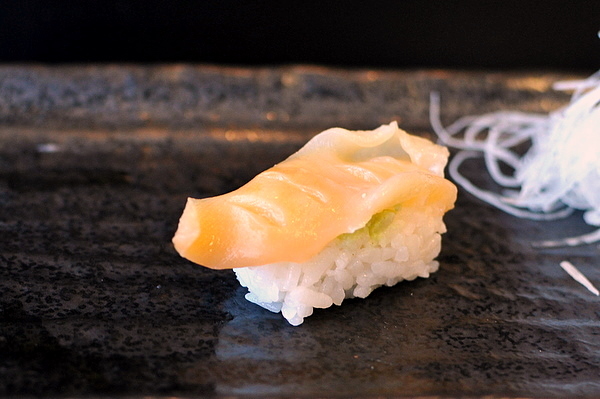 Amberjack can run the gamut texturally from lean and austere to creamy and unctuous and this definitely leaned toward the latter with a nuanced oily flavor to boot. 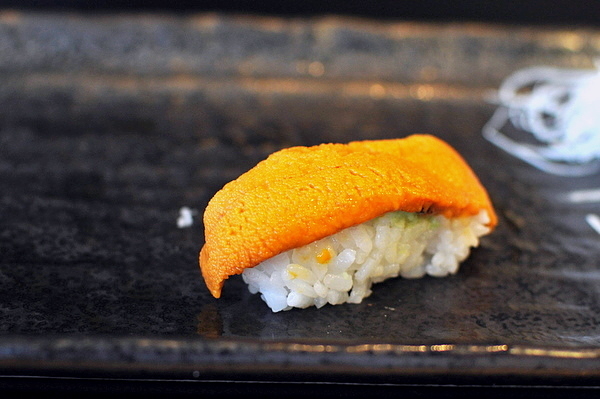 Nice to see the uni outside of a gunkan-maki, the scintillating sweetness of the urchin roe comes through completely unfettered by any distraction from the nori wrapper. Aside from Sushi Wasabi, this is the only other place in Orange County where I recall having raw albacore. 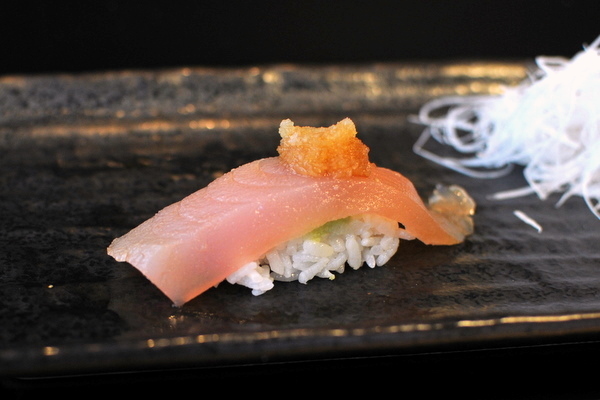 The fish itself was fairly mild but the topping of seasoned daikon lent the albacore an intense savory-sweetness. 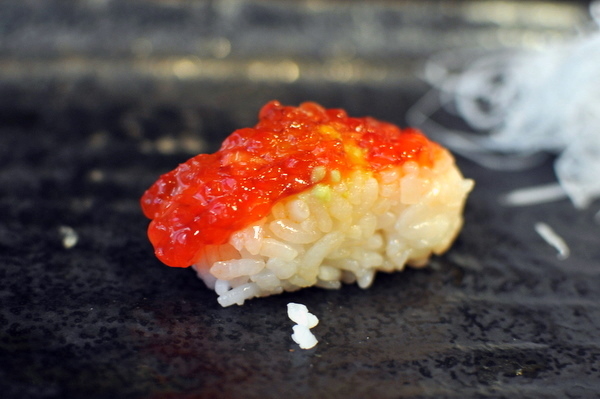 This was a completely new style of sushi, unlike the more common ikura, the roe is marinated in the egg sack concentrating the flavor leading to a more severe savoriness and viscous almost slimy texture, definitely not for the faint of heart. 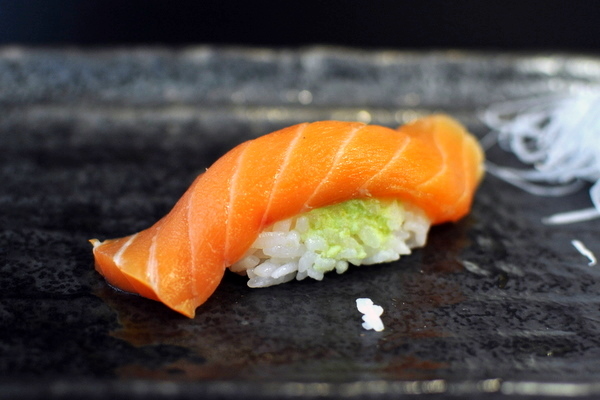 We followed the salmon eggs with the adult version of the fish; lush and simple with a striated firmness. 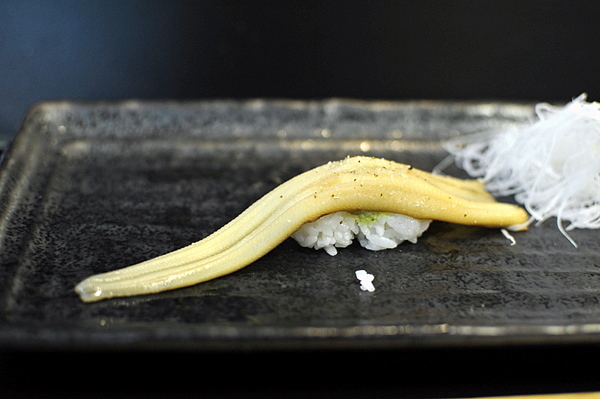 This is one of the few instances where I recall having eel without a thick layer of glaze. Personally, I found the sparse dusting of sea salt was quite effective at bringing out the natural salinity of the eel. We went back to snapper, but this time one wrapped in kelp which accentuated the fish's natural flavor while simultaneously tenderizing it. Despite being finely sliced to tenderize the flesh, but the squid did not yield the typical creaminess one usually gets with ika. One of the stronger saba pieces, the fish has an almost toro-like consistency and flavor, a nice compliment to the fish's oiliness. 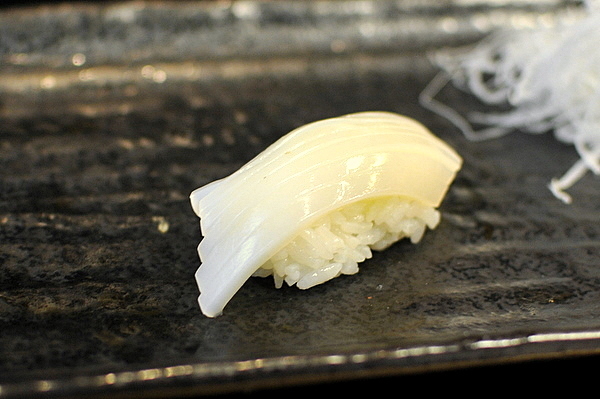 I've always enjoyed the texture of surf clam, paradoxically firm yet squishy though I found this to be noticeably more bitter than I was expecting. We were given a pair of rolls to aid digestion. 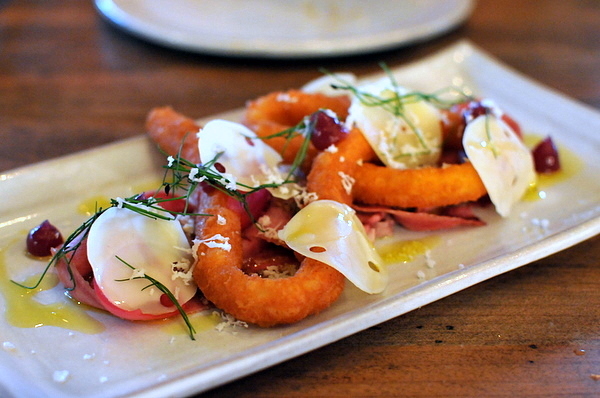 The kampyo was delightfully crunchy with a flavor reminiscent of a sweet pickled radish. 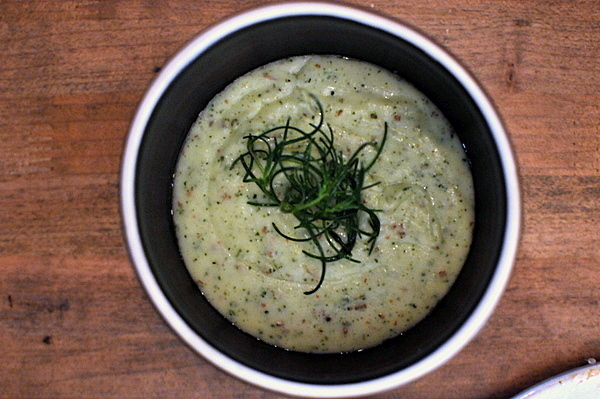 The ume shiso was more complex, marrying the fragrant mint with a piquant plum paste. 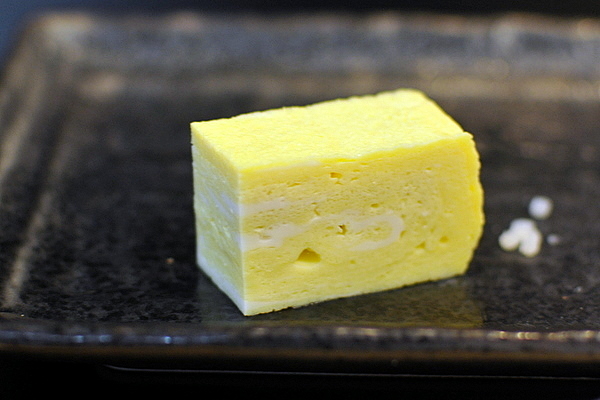 I've never been crazy about tamago, as the eggy funk can be a bit off-putting after so much fish. This was a more nuanced preparation that I quite enjoyed. 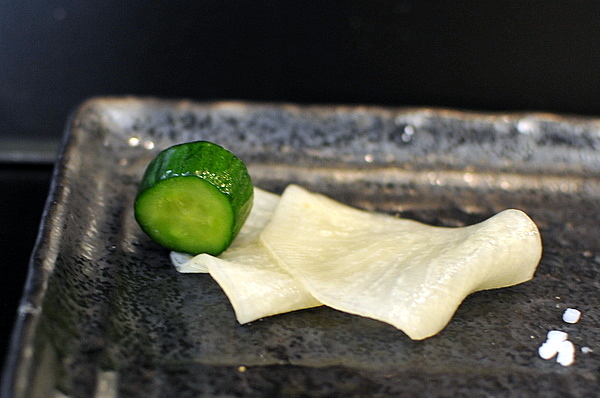 The meal finished with marinated daikon and cucumber to cleanse the palate of any lingering fishiness. Though I've always heard stories about sitting at the sushi bar versus sitting at a table, I've never experienced such drastically different experiences myself. My first experience, ordering omakase at a table, left me scratching my head at how Shibucho could be in the running for best sushi in Orange County. After having Naga-san take care of us at the bar, I no longer wonder. 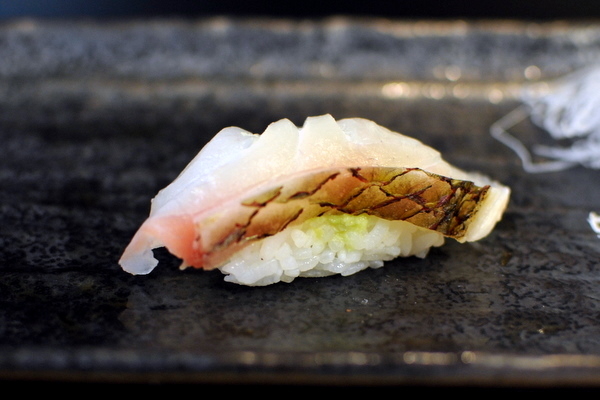 If you are looking for fresh, high-quality, no frills sushi then look no further than Shibucho. It is no exaggeration to say I've never been more excited for a restaurant opening than I am for tonight's opening of ink by Michael Voltaggio. Considering the first month's reservations were completely booked within an hour, I'm not the only one who feels this way. When he left The Langham in August 2010, Voltaggio optimistically expected to open his new restaurant before the year ended. A myriad of delays, including a lawsuit, delayed the opening for months, but today the waiting comes to an end. Built on the bones of the former Hamasaku, ink features a 60 seat dining room, a 10-seat bar for walk-ins and a private dining room that may be the future home of Voltaggio's omakase menu. 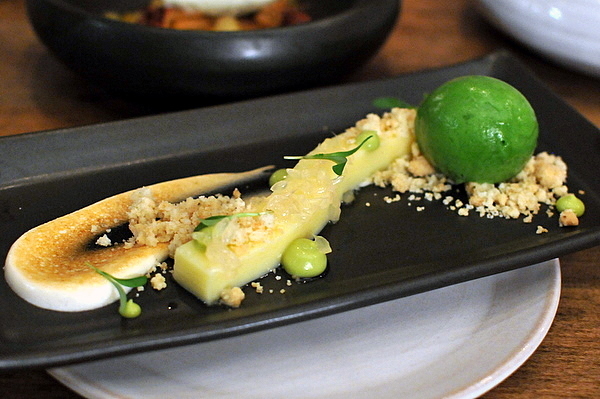 I first encountered the Top Chef Season 6 winner at The Bazaar, where he was Chef de Cuisine in charge of executing Jose Andres' contemporary tapas menu. Prior to coming to Los Angeles, Voltaggio rose through the ranks at The Greenbrier in West Virginia and headed Charlie Palmer's Dry Creek Kitchen in Healdsburg. As much as I enjoyed my later meals at The Bazaar and Saam, Voltaggio truly came into his at The Langham; breathing new life into the venerable but staid Dining Room. 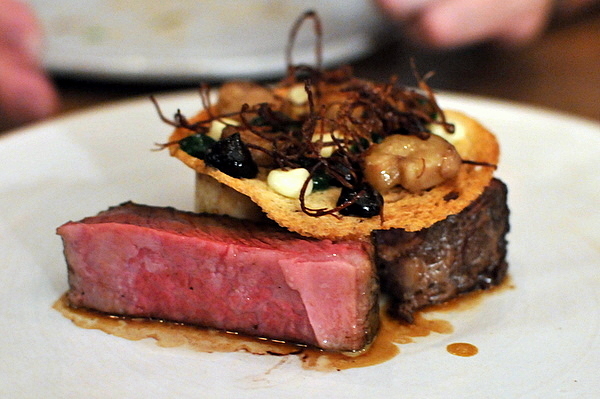 During the eleven months Voltaggio spent in Pasadena he blew my mind with two legendary meals at The Dining Room, firmly establishing himself as the most exciting chef in LA. 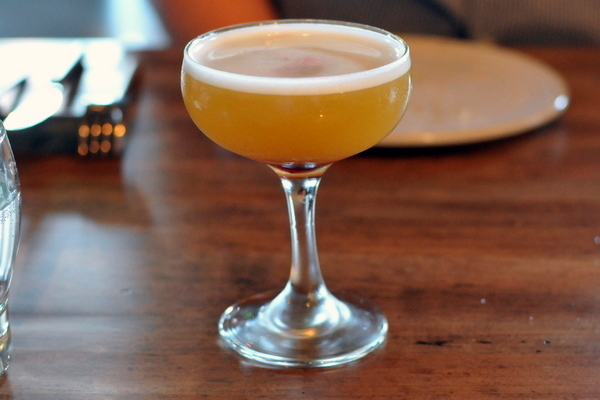 Tequila was made to pair with citrus and spice, and this drink had the form but lacked the polish. 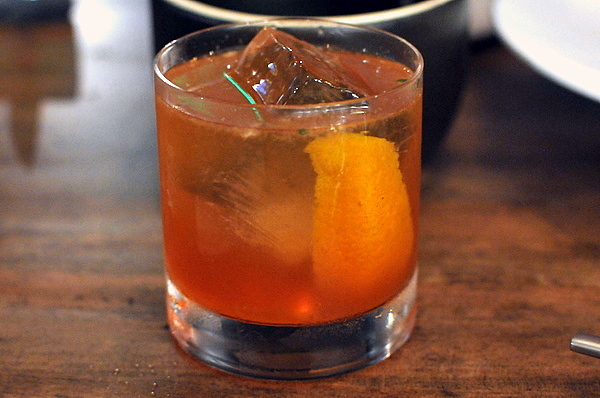 I could taste all the flavors, but the drink felt diluted, I kept hoping for a bit more sharpness and focus. 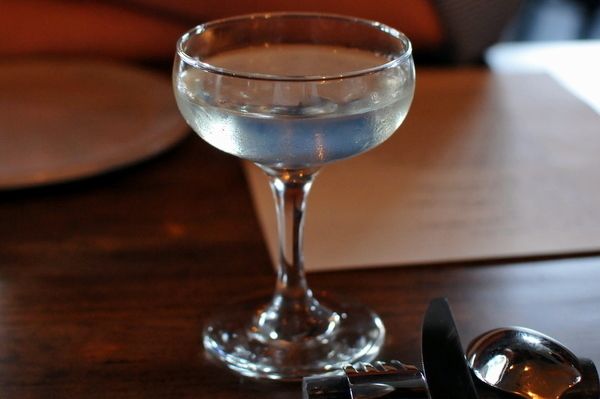 This was Devon's take on a classic gin martini. 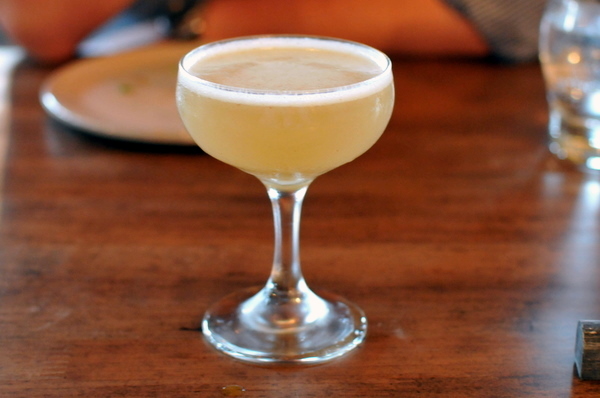 Exceedingly smooth, this drink went down like liquid velvet, the citrus aromas of the orange zest complimenting the herbaceousness of the vermouth and chartreuse. The meal opened on a high note. 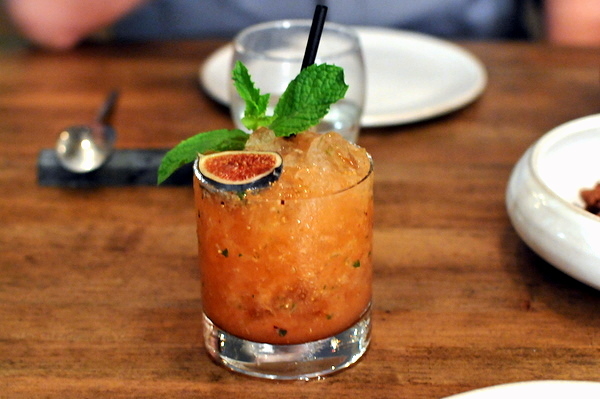 The citrus on the green papaya is simply electric, a screaming acidic counterpoint to the sedate creamy sweetness of the coconut and I haven't even gotten to the prawn yet. The shrimp provides a steady dose of salinity to the dish that helps ground the more expressive elements on the plate. 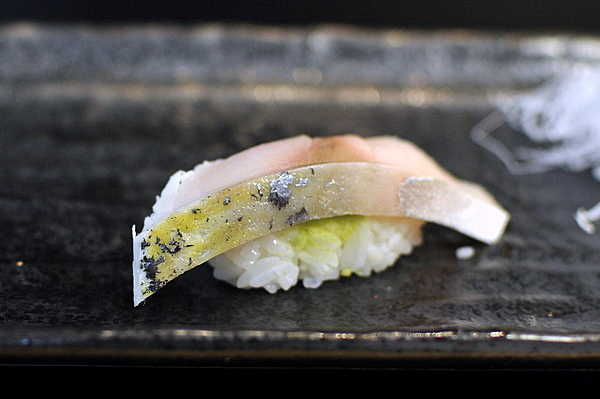 Though hamachi is a fairly mild fish, the apple actually accentuated the fish's oiliness while the soy and ginger ice gave the dish a comfortingly familiar feel reminiscent of a piece of nigiri. My big concern with such small scallops is cook time, it is all to easy to leave these dry and overcooked and while these were fairly moist, still a touch firmer than I'd like. 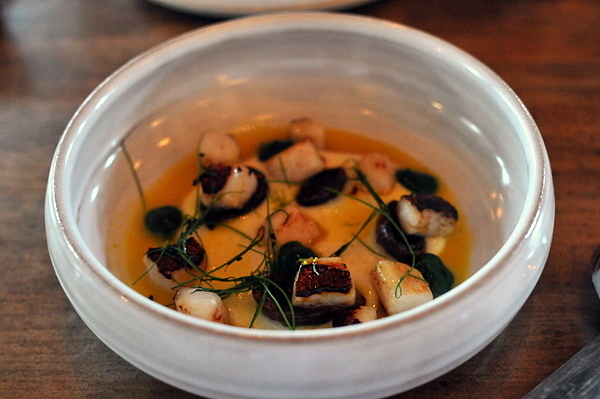 Still I appreciated the seamless interplay between the meaty scallops and the creamy heft of the potato. This was one of the stronger courses of the night, with the perfect oily richness to compliment the sweetness of the crab. The house made hot sauce reminded me of a tempered Siracha, and complimented the crab beautifully while the celery help balance some of the fried sapor. I didn't realize there were two choices of tonic, or I would have gone for the lavender. Like the tequila, I found the gin and house tonic to be a bit diluted for my tastes. The flavors were there, they just needed to be stronger. 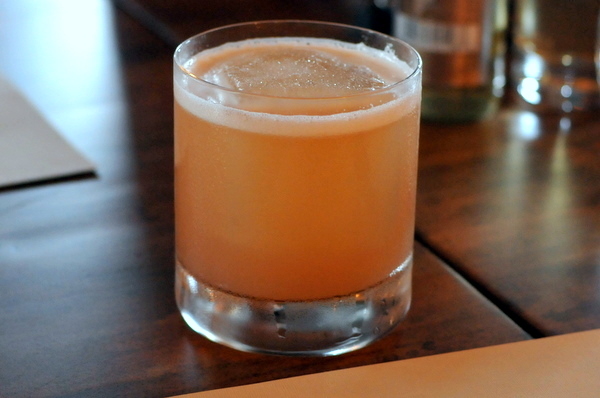 Definitely on the sweet side for a bourbon drink, I got a potent tropical sweetness tinged with a spicy bitter edge with the barest hint of the bourbon. Our waiter said this was his favorite drink and he was spot on. 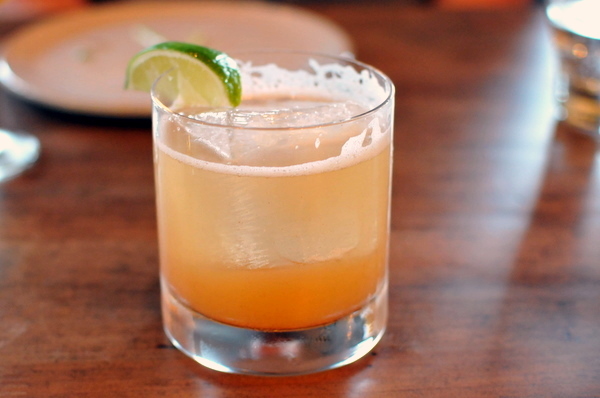 An overarching tropical sweetness precedes a cleansing citrus bite and the weight of the rum. This might be the best turnip dish I've ever had. The bitter vegetal succulence of the turnips contrasts perfectly with the tart frozen yogurt. The fried chickpea cake adds sufficient savoriness while the soil provides a delightfully earthy emphasis to the dish. This might be my favorite dish of the night. 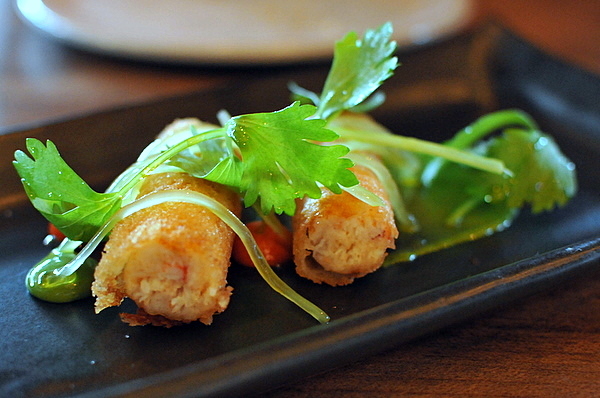 The churro could be a dish in its own right, crunchy and savory with just a hint of cheesy sharpness to compliment the peppery bite of the meat. The resounding tang of the pickled red onions cuts right through the cheese and meat leaving a lingering piquant sweetness on the palate. Though it didn't come in the 40oz bottle, this was a combination of malt liquor and orange juice, think of this as a ghetto screwdriver. 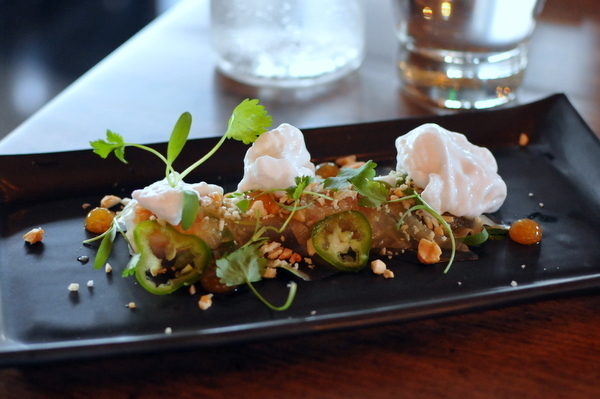 This was one of the few courses that made it through almost unscathed from The Dining Room. 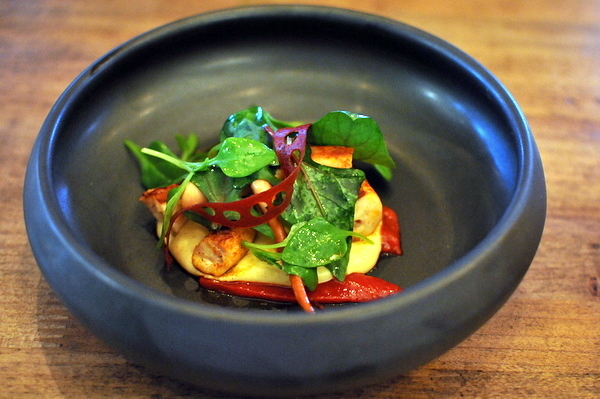 As much as I liked it back then, the dish felt more refined this time around. The octopus was more complex and nuanced texturally while I thought the piquillo stood out a bit more against the buttery heft of the popcorn. 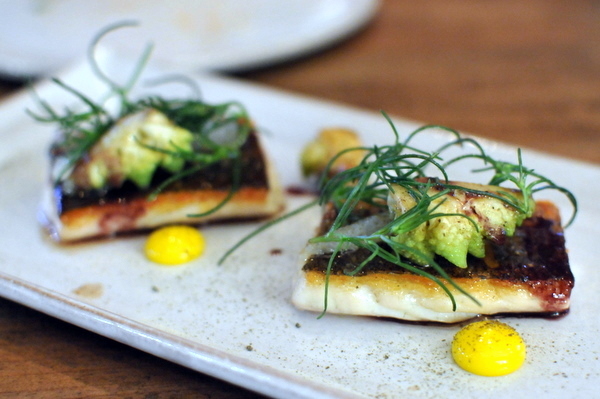 A simply beautiful sea bass, the alabaster flesh is flaky and tender while the mild flavor is complimented by a slate of tart accoutrements highlighted bits of tart grapefruit. Rounding out the dish is the crisp fried skin of the bass, unabashedly salty with a almost caramelized sweetness to it. A surprisingly simple yet effective course, the potatoes exude a buttery richness balanced by an assertive umami-laced salinity . Despite being called "spaghetti" there is actually no pasta in this dish. 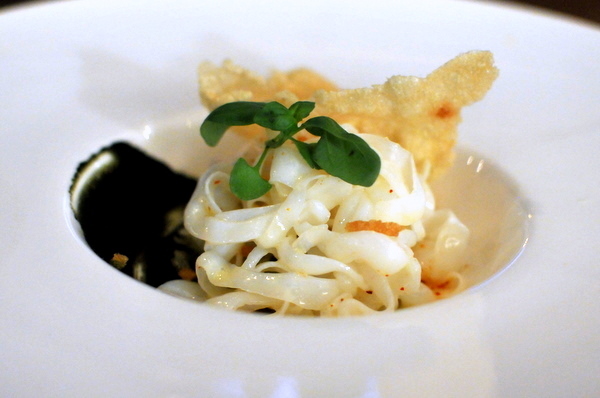 Instead the noodles are made of thinly sliced squid, giving them a snappy texture slightly north of al dente. I was surprised how well the pesto went with the pasta, its dull black hue belying its lively zest. 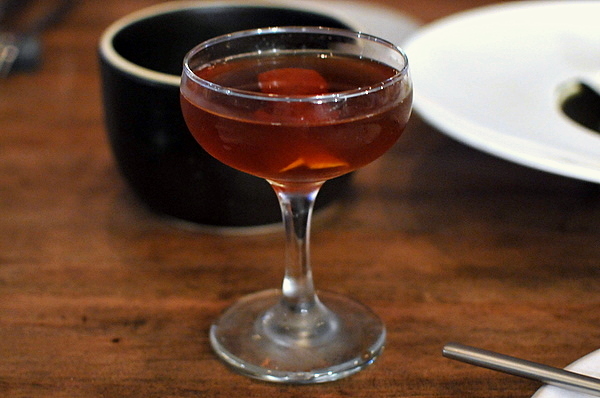 A derivative of the classic Manhattan, this was heavy but not overly alcoholic and a nice change from the lighter cocktails. Definitely one of the more complex drinks of the night. The cloyingly fruity attack evolves into a much more nuanced finish with a delicate balance between fruit and herbal flavors. This was a fairly unconventional preparation of black cod. 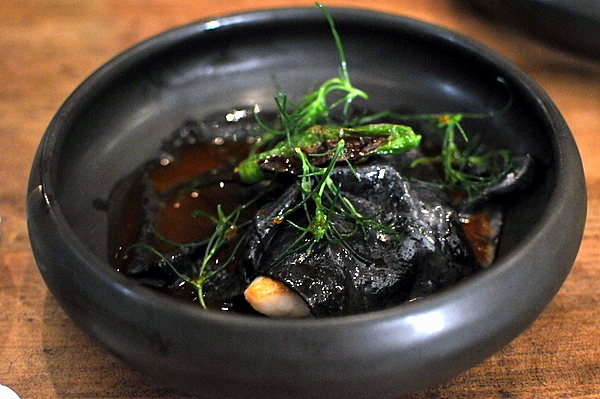 Rather than smother the fish with sweetness, the dashi and kelp provide a rounded umami essence while the peppers add a jarring bitter contrast. 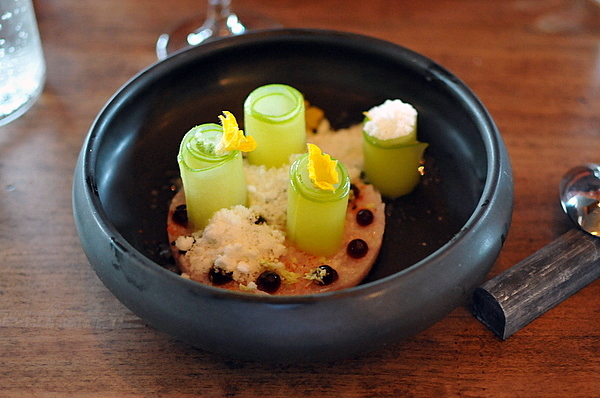 I would have liked to see some more from this fish, perhaps a nice char to draw attention back to the star of the dish. I don't think I've ever seen congee in a fine-dining restaurant. The texture of the rice was spot on, and imbued with a rich earthy emphasis from the mushrooms. 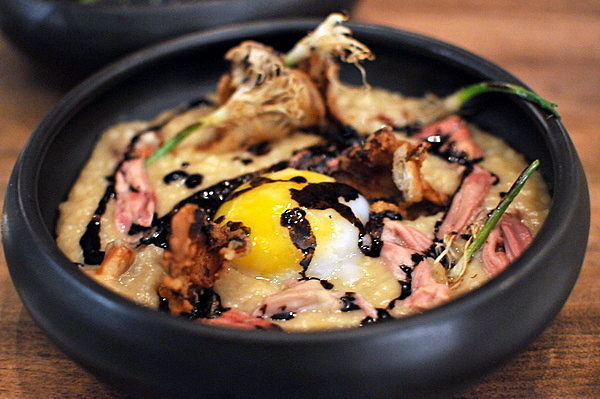 The duck tongue was a little lost on the dish, but I still enjoyed the hearty flavors of the porridge immensely. 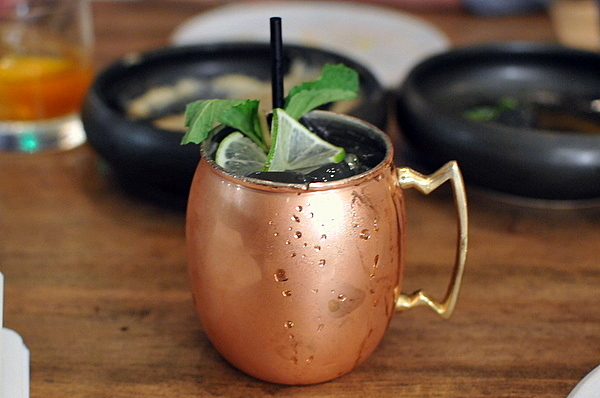 This was a classic Moscow Mule right down to the copper cup. The tooth aching chill and effervescent ginger-lime spice were the perfect palate cleansers for the heavier dishes ahead. 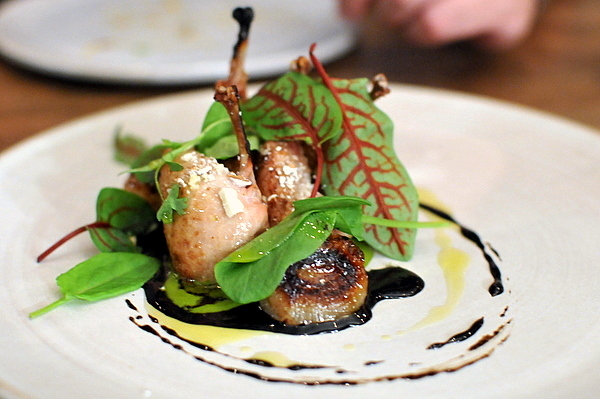 It has been a while since I've had a quail dish with this focus and depth of flavor. The meat fairly oozes with the savory essence of game bird and the exterior is accented with a light caramelized sweetness. Though I appreciated the juicy smokiness of the onion and the levity of the greens, the bird could have easily stood on its own. This is veal to the nth degree, the meat itself is so tender it is almost jellied in its consistency, no chewing required. The crispy rice was reminiscent of the popcorn we had earlier, but when combined with the curry and subtle undercurrents of lemongrass made for a very complete Thai-inspired flavor. 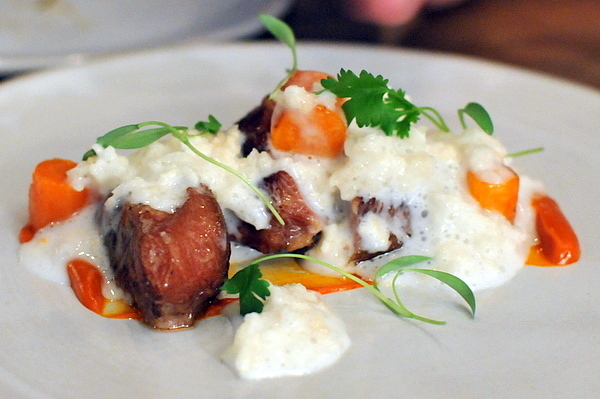 The beef short rib was one of my favorites from The Dining Room so I was glad to see it on the menu at ink. The meat is just as wonderful as I remember, smoky, meaty and tender but with a supple resistance. Unfortunately I was feeling a bit full by this time so the marrow felt a bit overwhelming, especially when taken with the already ponderous short rib. 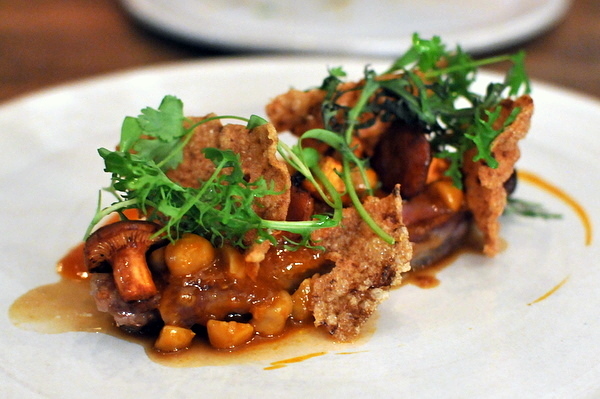 Iberian pork - chanterelle mushrooms, mushroom chicharron, hazelnut "beans"
Apparently, this was a loin from Iberico de Bellota, arguably the most prized pork in the world. The meat itself is pure decadence with a subtle sweetness reminiscent of char siu. I especially appreciated the unabashed saltiness of the mushroom chicharron which helped highlight the savoriness of the Iberico. Another heavy course, I think I would have appreciated this more if I weren't so full. This is easily one of the top five cheese presentations I've ever had. The cheese itself is beautifully nuanced, with a slightly gamy tang and mild blue-like flavor tinged with a creamy sweetness. The accompaniments run the gamut from savory to sweet to vegetal and despite the sheer complexity and number of moving parts taken together the dish just sings. The grapefruit curd was surprisingly subdued. I was expecting a mouth puckering acidity but the flavor as more of a gentle tang marked by a round sweetness. 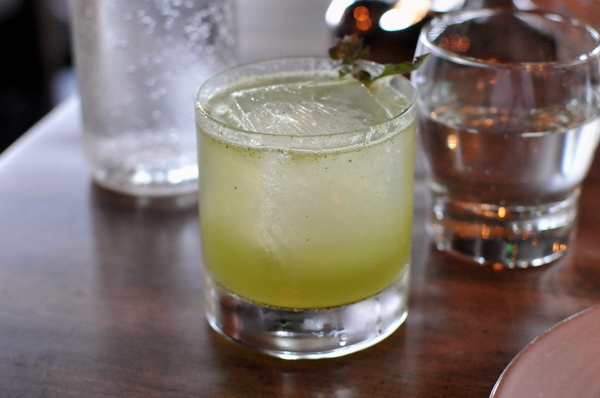 What did really get my attention was the cilantro; its fresh verdant savoriness fairly explodes on the palate. This was hands down the table favorite for desserts. The velvety disc of crème caramel almost reminded me of a foie gras terrine in terms of texture. 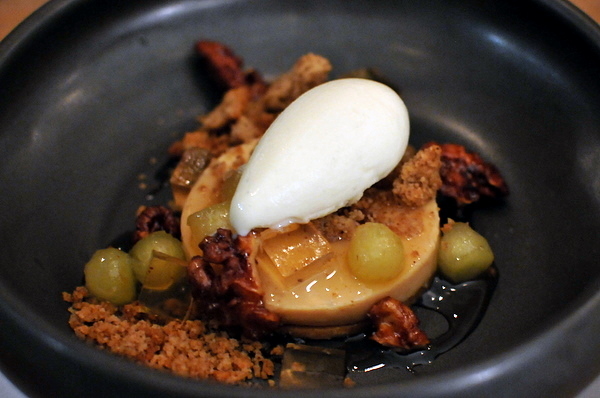 The sweetness in conjunction with the complex smoky essence of the burnt wood ice cream was nothing short of wondrous. 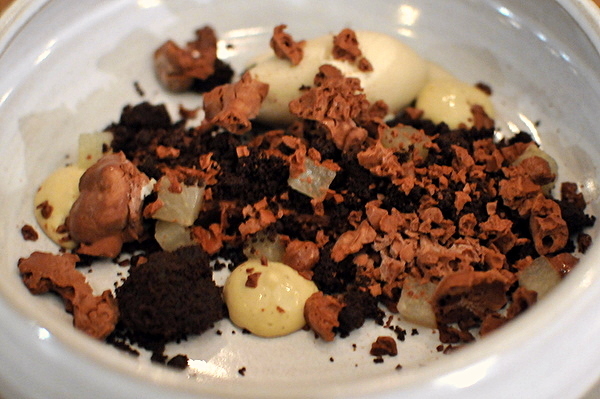 The chocolate felt a touch simplistic especially after the complexity and grace of the two preceding desserts. 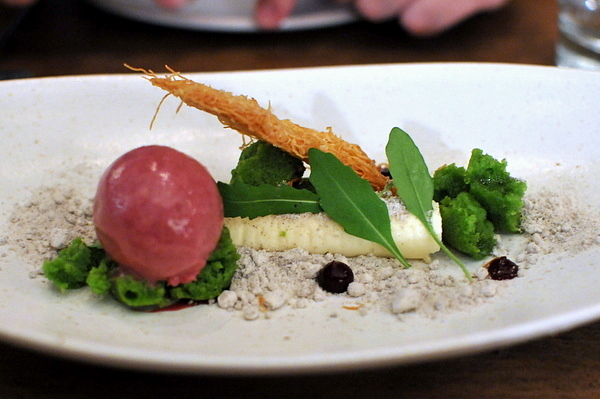 I found this dessert a bit monolithic, with a pure note of coffee that resonated throughout. We were going to order this drink earlier but our waiter recommended we save it for dessert which proved to be a wise decision. 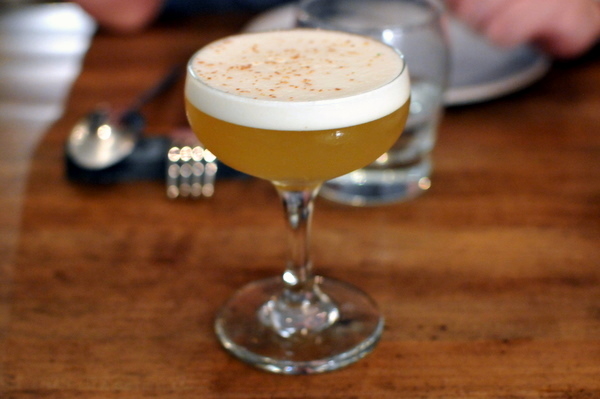 The egg white foam gave this libation a satisfying thickness while the flavor reminded me of Christmas. I was expecting the figs to dominate and they were apparent to start but as time wore on the mint and lemon played a bigger role. Fourteen months and five days after leaving The Dining Room, Michael Voltaggio and crew are back in the kitchen where they belong. 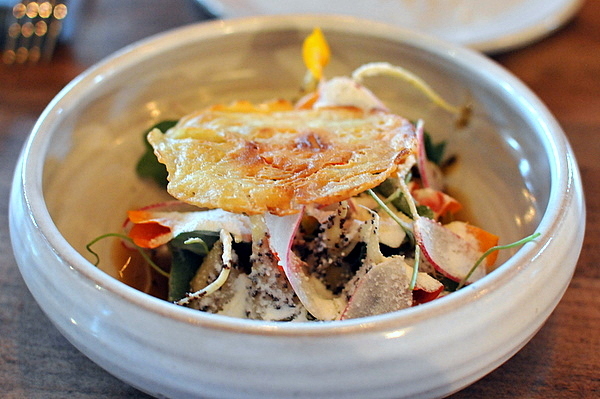 Voltaggio's trademark creativity and progressiveness are on full display, with an impressive slate of 20 well developed and well executed courses. Twice Chef Voltaggio remarked that he would have rather Kevin come a week later. I'm here to say the entire experience from the food to the service felt as if the restaurant had been open for months. Food was paced perfectly, with dishes coming one or two at a time and never more than a few minutes between courses. Compared to The Dining Room, ink is decidedly more accessible, exhibiting a whimsical joie de vivre that should make it an overnight sensation. Welcome back Michael, you were sorely missed! 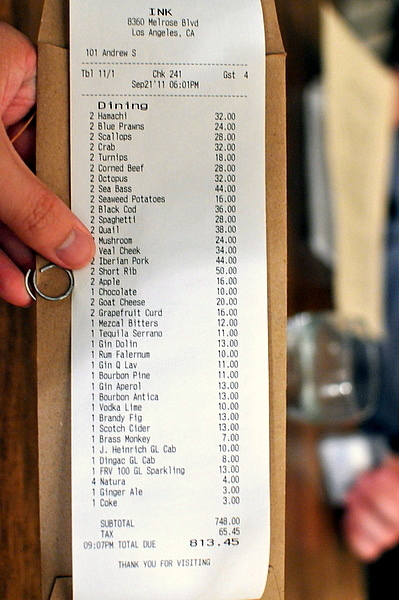 Now if I could only weasel my way into a seat at the omakase bar.